Explanation: Dimke GetTime, or more exactly, gettime.sh, is a native Unix shell script which creates a slim html page during runtime. 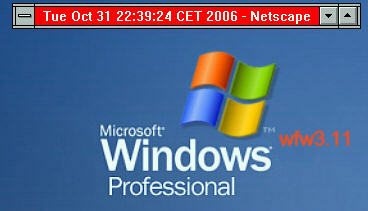 This is sent to the calling web browser which shows the current date and time within the window title. It is completely independent of the operating system or browser and it runs upon the standard http protocol over the standard http port rather than using the ntp protocol, what means, that it even runs on a web browser behind a firewall. How it works: Dimke gettime.sh is written in Bourne Shell code for Unix webservers which allows to communicate with any kind of web browsers. It calls itself by sending a meta refresh command to the web browser, so there's no need to press the reload button to keep on track with the current date and time. Also, Dimke gettime.sh is very slim, so it won't eat up the whole network bandwidth, and, the relevant information is only written into the window title rather into the window content area, what means, that the window can be minimized up to the window title bar and can be moved to any location on the monitor. Nota bene: This is extremely useful for ebay auctions to always get the correct time information from a trusted webserver. One note: In the source code there does not stand the static file name within the meta refresh command, but instead there shows up a "$0", what is the shell convention for the current program's name. So, Dimke gettime.sh can be renamed to any filename without the need to rename this entry in the source code also. For instance, to "just confuse the russians" one could rename this Unix shell script to "gettime.exe" or similar. The first line reads "#!/bin/sh" and tells the system to call the right interpreter, in this case it is the /bin/sh(ell), no matter what filename is assigned to it. How to use: First, get the zipped package, unzip it and transmit it to the webserver's cgi directory. In most cases it is something like /home/username/cgi-bin. Don't forget to chmod u+x it on the command line or via the site command of the ftp client to make it executable. To invoke it like shown in the picture above just type http://www.webserver-name/cgi-directory/gettime.sh in the browser's Url field and keep it running as long as needed. After that, just close the window. And, don't forget to bookmark it.